until 2001 ))) Interested in Arts and Music since childhood , having a grandfather with an innate talent for drawing who delighted Ramam with his gift, Ramam was raised listening to Samba, MPB, Bossa Nova… When he was still very young he used to compose carioca funk music with friends at school, and, thereafter, joined some pagode bands and the young band of our church, when he learned how to play him first instruments: pandeiro, tan-tan, repique, and cavaco. 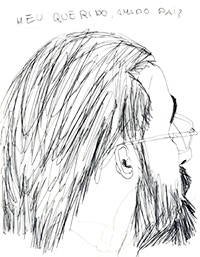 In the middle of 2001, happened the first Major turning point in him Life due to the Passing of him beLOVEd brother Patrick Bravo … since this painful movement, Ramam has begun to ask himself about the Meaning of Life and dove in the Eastern traditions, fascinated by the Usui System of Natural Healing (of Japanese origin). 2002 ))) About that time, Ramam has come to know of the first musician who would greatly influence this Soul, thirsty for Meanings: Oliver Shanti. Oliver’s countless CDs were like true portals which carried him far away frOM this time. Thanks to this Being and his valuable work, a deep reverence for the shamanic traditions have awakened within Ramam. 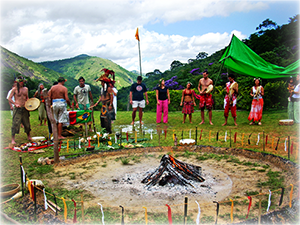 That year, Ramam would also work as a volunteer at the Reiki Sem Fronteiras Association , until 2005. 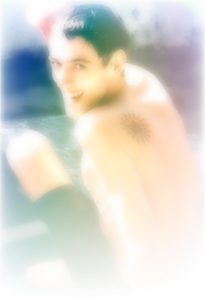 2004 ))) It was in that year that this music path have really begun! After experiencing the traditions of Buddhism, Taoism, Shamanism and Hinduism, Ramam would come to know (by means of orkut!) 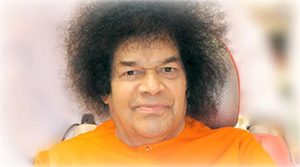 the Life and Work of the great tutor and Indian master Sri Sathya Sai Baba . By means of this delightful Avatar, he would discover the Organic Music in the old Organic Choir “Vozes Sai” of Sri Sathya Sai Center of Vila Isabel. That’s when he was allowed to experience for the first time what he would come to know years after as the well-known Transdisciplinarity. Since then, Ramam has been dating the ethnomusicology and learning more, by means of music, about so intriguing and integrated forms and customs which native cultures have always kept with Mother Nature. For this period Ramam first hear the amazing sound of the kalimba through this precious flash presentation* that dear friend and designer Durga did to her old site, with the song “Ritual”, by Chandra Lacombe . After being fascinated by this sound and that distinctive voice, Ramam researched for several months until find the instrument that resonate the unique sound and the inspiring musician that masterfully plays and deeply enChants this Soul. 2007 ))) This year a new musical approach fills an internal demand for which my heart so much aspired: using sound intentionally for alignment with the Inner Being and connection with the Higher Self. 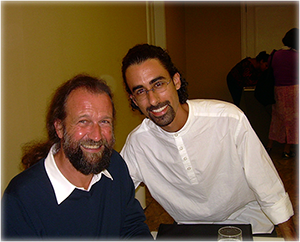 This knowledge comes through meetings and workshops with the beLOVEd and inspiring Guy Lussier, a Canadian therapist with a wonderful gift of caring and amazing faith of healing! Through its French Yoga of Sound approach, channeled by a great French medium of the last century, Ramam start this deep and systematic cleanup work at the cellular level by the Singing of French Vowels. 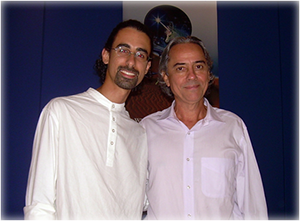 2008 ))) In 2008, He has begun his Basic Holistic Formation at UNIPAZ-RJ, where he had the rare opportunity to meet and learn with the great professors Pierre Weil, Roberto Crema , Jean-Yves Leloup and Glória Sobrinho. At this University, which instructs for Life, Ramam has further integrated his Artistic Vocation by understanding, thanks to its methodology, the importance of Being Who We Are, thus taking hold of his Dreams and Goals in Life. 2009~2010 ))) Ramam would begin the work as Facilitator of Organic Music in 2009, with workshops held in Brazil (Rio de Janeiro and São Paulo), Nepal (Department of Music of the University of Kathmandu) and India (Verité, Auroville), where he has lived for 9 months in order to plunge into the millenary practices of these traditions. 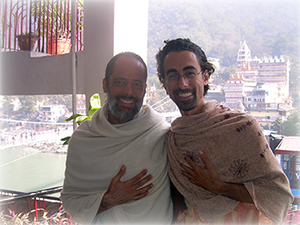 At Rikhya (North India), Ramam has attended a course of Nada Yoga at Bihar School of Yoga with Swami Muktidharma , Swami Niranjanananda and the Swami Satsangi. He has attended Classical Hindustani Singing lessons with Laxmi Santra and has had the rare opportunity to play kalimba and pandeiro for Sri Sathya Sai Baba, with more than 300 devotees from Brazil, as well as to take pART in the Maha Khumba Mela of 2010 at Ganges and play for Sri Prem Baba . In the same year, Ramam would develop the visual identity of SOM DA LUZ – Harmony and Development through Music, the inspiration of which was born in the sacred grounds of Mother India, and he would give Birth to his personal approach of this therapeutics. A lot of this search can be found in his first blog: www.danielramam.blogspot.com.br (migrated from extinct multiply.com). Ramam also took pART in the 5th International Holistic Education Conference - of Pedagooogia 3000 featuring Noemi Paymal, at Auroville/Pondicherry. In the field of sustainability, he would hold some workshops about the subject at Auroville, highlighting an experience of 2 days with one of the creators of Deep Ecology, John Seed. 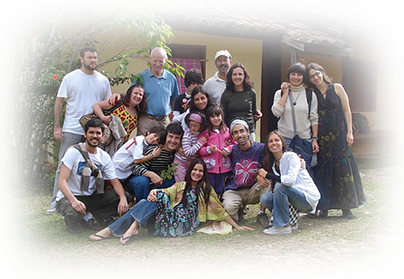 Returning to Brazil, he would also take pART in the Social Module of formation in Sustainability Design of the Gaia Education in 2010. 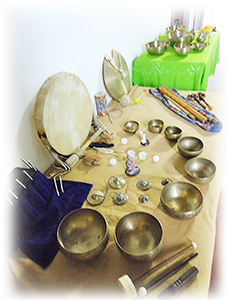 Still in 2010, Ramam would finish the complete formation of 4 degrees in Sound Massage with Tibetan Singing Bowls by the Peter Hess Method with Ingrid Ortelbach, certified by Peter Hess Institut (Germany). 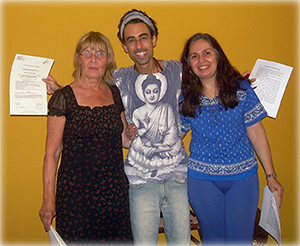 Ramam is deep grateful to the dear friend Regina Santos for bringing this method to Brazil. 2011 ))) Ramam was invited to pARTicipate in the TV show Alternativa Saúde (Alternate Health), of cable channel GNT, as a holistic specialist to cases of hearing loss analyzed in the TV show of Patricya Travassos. Watch the TV show in 3 pArts in our video gallery!. 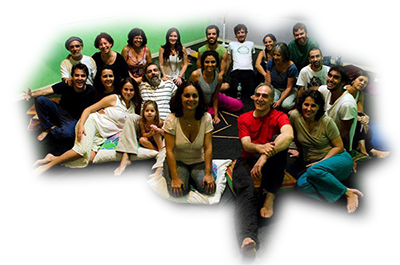 In this year Ramam starts the 1st class of the training of Facilitators in Organic Music , with Ricardo Oliveira (creator of this genuinely Brazilian approach), Fernando Neder and Paulo de Tarso. 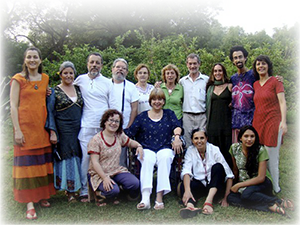 In the field of Education, Ramam designed and organized along with friends the 6th International Holistic Education Conference – Pedagogia 3000, frOM 8th to 17th July, 2011. Youtube Channel: www.youtube.com/user/pedagooogia3000rio. 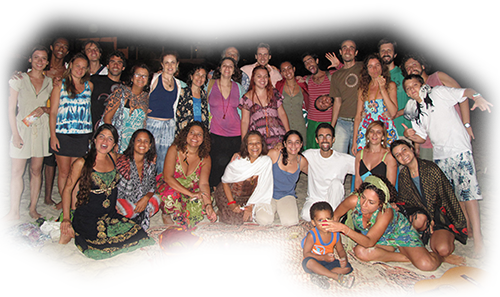 It is at this time that he also promotes for about 1 year circles of songs and meditations on Ipanema’s Beach , in meetings called “Amigos Lunares”, in partnership with Vanessa Kober and starts performing Meditative Concert with Massage Therapy in partnership with dear and ex-girlfriend Renata Oliveira. É nesta época que também promove durante aproximadamente 1 ano rodas de música e meditações na Praia do Diabo , nos encontros chamados “Amigos Lunares”, em parceria com a amiga Vanessa Kober e inicia a realização de Concertos Meditativos com Massagem Terapêutica em parceria com a querida e ex-namorada Renata Oliveira. 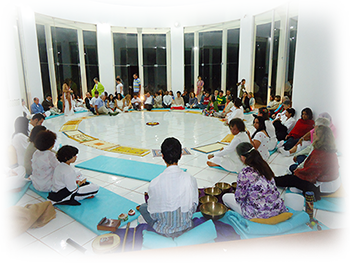 2012 ))) In the New Year’s Eve of 2011 to 12, Ramam offered a Meditative Concert and Sound Massage appointments along with Regina Santos at the event “Mythology: the story of the soul” of the Theosophic Institute of Brasilia at the Ecological Reserve Paraíso na Terra. 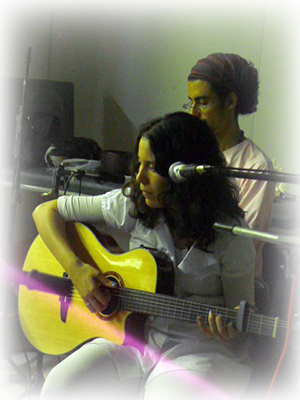 In February, Ramam would take pART in the musicalization of a workshop about Multidimensional and Familiar Constellations with Organic Music of the dear LightSister Marly Cordeiro, at Salvador/BA. 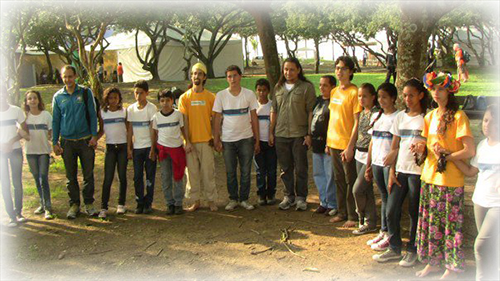 In June, during the Rio+20 Ramam offers with friends playful activities for children in a public school by project Semeação – Educação Cocriativa and he has the great pleasure of composing the band of Sangha Rio of Sri Prem Baba in his 1st Public Meeting in “wonderful city”! 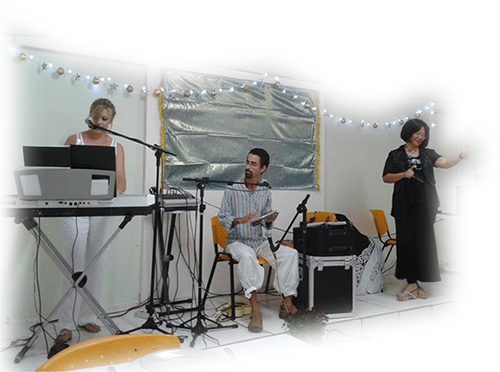 2013 ))) Again on New Year’s Eve 2012 ~ 13 Raman was invited by the Theosophical Institute of Brasilia to compose the band of New Year in Ecological Reserve Paraíso na Terra, where he also has the opportunity to offer a Meditative Concert on the 1st day of the year, and make various consultations on Sound Massage with tibetan bowls, didgeridoo, kalimba and voice. 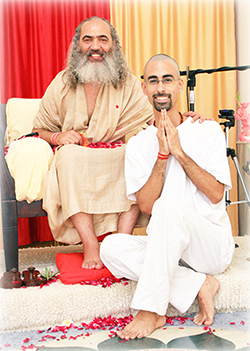 Again in June Raman has great realizatiOM to play with the Sangha Rio to his beloved master Sri Prem Baba, in his 2nd Public Meeting in the city! 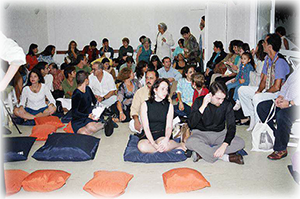 In August, at the invitation of friend and teacher of Yoga KiuMars starts the core of Cant com Amor Movement, which inaugurates in the city a new way to realize Circles of Songs, yoga, singing and meditation Journeys and Retreats, with intend to dive deep into the experience of joy, love and interconnection. This movement seeks to nurture the kind of community that inspires more people to manifest the change we want to see in the world. Our channel on youtube here! 2014 ))) In May of this year another musical puppy is given birth to partner with the friend Tamara Steiman witch nurse her vision to fill with Music and Magic Rio de Janeiro squares with your project Ilumina Rio, which was also part of an old dream of Raman to occupy public spaces which he had also started before in partnership with Unite in Babylon Movement, since then much enhanced by Ilumina Rio. Our Youtube channel here! 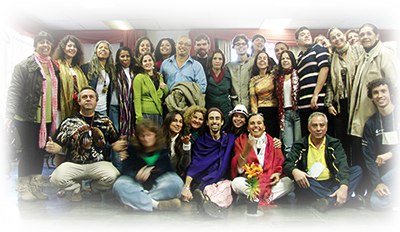 In July and November Raman presents with the Sangha Rio in large public events with Sri Prem Baba in the city: in the Collective Meditation for World Peace (in July), and in the Awaken Love Festival (in November) with public satsangs in the Christ the Redeemer, in Space Tom Jobim and in Vigário Geral at AfroReggae Cultural Center, as well as he was invited to play in Quiet Retreat in Spa Maria Bonita, Nova Friburgo/RJ. 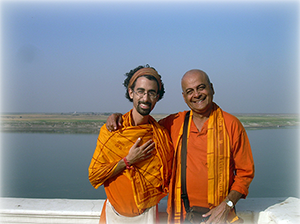 And from August to October Raman had immersed in Alto Paraiso Season with Sri Prem Baba, performing daily with great musicians of this Sangha kirtans and bhajans of the program.